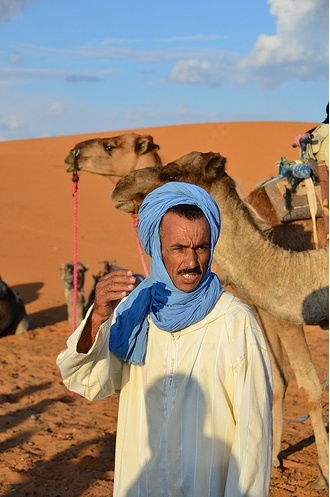 Is Morocco on your travel radar? Let us tell you of our experience when we visited Casablanca for the day while on a cruise and also some sound advice, stories and tips from one of our travel writers who visited the area in October 2011 Robert visited the cities of Chefchaouen, Essaouira, Fez, and Marrakech, and spend a night camping in the Sahara Desert near Merzouga. Everyone has heard of the famous Casablanca from the old movie so to actually visit Casablanca it is very nostalgic. With only one day to see the city it was a little hard to see all of it and the famous Marrakech was hours away and not feasible to visit in one day. We hired a taxi for a few hours and asked him to take us to see the most relevant parts of the city. Initial appearance was that it was a dirty, third world country however when he took us to the famous Mosque it was breathtaking. The Hassan II Mosque or Grande Mosqué is the largest mosque in Morocco and the 13th largest in the world. Its minaret is the world's tallest at 210 metres. This flamboyant building was built at enormous expense as a token to the former king's 60th birthday. The hand carved stone and wood along with the intricate marble demonstrates the very best Moroccan artisanship. Once it started to get dark, it was like families came out into the streets with the kids. There was music and a carnival style atmosphere. In the centre of a HUGE square we saw hundreds of people of all ages and over a hundred small motorised cars for the kids to ride around on. It was very much the family carnival atmosphere. It certainly. was a place that I would have liked to explore more. Perched above cliffs that recede dramatically into the North Atlantic, the seaside city of Essaouira, Morocco is set amid scenery that seems more befitting of Brittany or even Western Ireland. 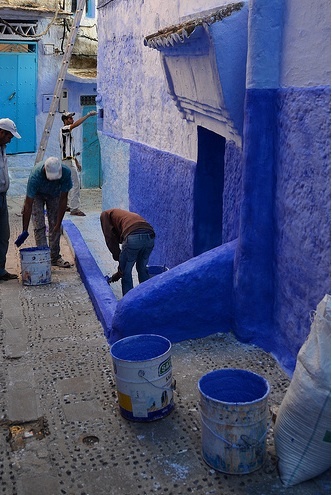 Its bone-white buildings accented in deep blue are about as far as you can get from the warm reds and pinks that define medinas in Moroccan cities like Marrakech and Rabat. These reasons alone make a trip all the way to the western edges of the African continent all the more rewarding. Once you can learn to pronounce and remember the city’s strange name, book a bus ticket to Essaouira, the sparkling gem of Morocco’s Atlantic coast. Morocco sits just across the Strait of Gibraltar from Spain, but the two countries couldn’t be more different, architectural styles notwithstanding. Although Spain is far from the most sophisticated country in Europe, it is more modern than Morocco in just about every way you can imagine. Still, as countries in the developing world go, Morocco’s transportation infrastructure is quite modern. Whether you use buses, trains, taxis or any combination thereof, the experience of getting around in Morocco is about stress-free as you’re going to find in most of the Middle East and North Africa. Although I landed in Casablanca, my first destination in Morocco was actually Marrakech, the country’s most popular city for foreign visitors. Not only was a fast train from Casablanca’s Voyageurs railway station to Marrakech available, but I was even able to make a rail connection between the Casablanca airport and the city center, something relatively rare in the Middle East and North Africa. Indeed, the most obvious lasting benefit of Morocco’s colonial link to France is the modern rail system that France has helped develop over the past several decades. This continues to the present day: Morocco’s first high-speed TGV (tren à grande vitesse) line, which will connect the capital Rabat with both Casablanca and the port city of Tangier, is expected to open by 2015. You can take the train between most any major city pair in Morocco, be it for a short from from Fez to Casablanca or the long-haul from Tangier all the way to Marrakech. For more information, visit the official Moroccan Railways Website. My first bus experience in Morocco took me from Marrakech to the charmin coastal city of Essaouri, about four hours to the west. Unfortunately, my travel companion Erin and I got to the Marrakech bus station too late to catch the “good bus,” so we ended up having to settle for a dusty, cramped local bus we would later found out had cost us the same amount, on account of being foreigners. If you can, book a bus through government operated CTM — the aforementioned “good bus” — at nearly any bus station in Morocco. For schedules and rates, check out CTM’s official website (which is unfortunately often down for maintenance and is only available in French and Arabic) or ask the front desk staff at your hostel. Thanks to the generally low price point of transport in Morocco, you may be able to justify the usual luxury of taking a private taxi (in Morocco these are known as grand andpetit taxis, respectively) to traverse long distances. After I’d finished my time in Morocco’s Sahara desert, for example, I couldn’t bear the thought of spending seven more hours between the city where I was and Fez on a bus, even a “good” CTM one. As it turns out, the full-care fare for a petit taxi to traverse said distance was just 720 DH, or about twice the cost per-person of a seat on the bus, which wasn’t due to depart for more than eight hours after I needed to leave. You can also rent cars in Morocco, although I am not sure I would personally feel comfortable driving on most of the rural roads throughout the country. The highways, on the other hand, are quite good. 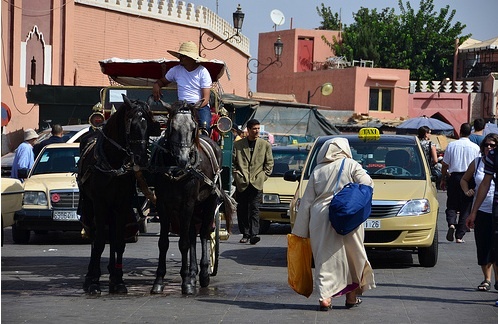 Not surprisingly, Moroccan cities are completely lacking public transport. For longer distances, you’ll need to hire a taxi (or, if you want to be really silly, a horse-drawn carriage) while most cities’ medinas are perfectly suited for leisurely walks. However you choose to get around in Morocco, I imagine you’ll find it to be easy once you’ve spend a few days there, particularly if you’ve traveled in other developing countries, whose transportation infrastructures generally pale in comparison to that of Morocco. Even if you aren’t headed to Morocco anytime soon, check out my photo essay about the country to get a feel for the beautiful sights you’ll find there. Known as “Tassort” in the local Berber language and “Mogador” in Portuguese, Essaouira (pronounced ess-oo-wee-rah) was first explored by the Carthaginian navigator Hanno around 400 B.C. More recently, in 1506, Manuel I of Portugal established several forts there. The Portuguese retreated less than half a century later; The French had come and gone by 1700. The city you see now when you set foot in Essaouira began in the mid 18th century, when Mohammed III of Morocco began using it as a port for trading with European powers. Although initially fruitful, this decision would backfire in 1844 at the onset of the first Franco-Moroccan war, which would once again relegate Essaouira to French control, between 1912 and 1956. It was during this “French protectorate” period that Essaouira began to gain popularity as a tourist destination for Europeans. As is the case throughout much of the rest of Morocco, French cultural influence in Essaouira is still strong. The best way to travel to Essaouira from Marrakech is by bus. As I detailed in my post on getting around in Morocco, two bus options between Essaouira and Marrakech exist: The government-run “CTM” bus; Or a public, local bus. In Morocco, “government-run” is synonymous with “high-quality” and “legitimate,” so you should book a CTM bus if you can. As of January 2012, these depart Marrakech at 8 a.m. and 12 noon. Regardless of which bus you take, the cost is 80 D.H. (about $12) one-way and the journey takes between three and fours hours. One word of advice: Do not eat any of the meat they sell along the road there. You will regret it! Although Essaouira isn’t a tourist hub along the lines of Marrakech or Fez, it is a popular spot for foreign tourists and Moroccan locals alike. As a result lodging options are plentiful, where you prefer luxury hotels, basic hostels or anywhere in-between. Since this is Leave Your Daily Hell and my budget policy is always “as cheap as possible,”I’m going to recommend hostels. Personally, I stayed at Riad el Pacha, a charming riad-style hostel located just off the main shopping street. The riad had the classic open Moroccan construction and a lovely rooftop terrace that provide an amazing view of the entire city. You can also stay at the Hostel Essaouira, which is the most popular hostel on HostelWorld. The only reason I didn’t stay there is that they were full when arrived. And as you might remember, I’m not a fan of booking in advance. As is the case throughout much of the rest of Morocco, Essouira is filled with a plethora of dining and shopping options. You can also hop another bus a few hours south to Agadir, Morocco’s surfing capital. Above all, however, Essaouira is a place to relax. Whether you stroll the old stone street of the medina, along any portion of the city’s Atlantic coastline or even head south to its camel-laden beaches, you’re sure to leave Essaouira feeling much more refreshed than you did when you arrived. Essaouira’s association with Jimi Hendrix is one of its longstanding and most endearing myths! Although the infamous rock musician did in fact visit Morocco in 1969 it was his only visit to the country and despite many claims he did not own property there. Apparently almost every local has a story about how Hendrix touched their lives and this café in Diabat has built a whole tourism attraction around him. This partnership between Sofitel and Thalassa Sea & Spa delivers luxury for health-conscious travellers visiting Morocco. The resort opened in April and its spa delivers holistic programs involving naturopath consultations, alternative medicine and personal training. There's a healthy dining menu created by Patrice Demangel, the brains behind the world's first health-conscious fine dining restaurant. Rooms from $230 a night.